From his involvement with seven Olympic Games, starting with Seoul in 1988, to winning the Sony Broadcaster of the Year award in 1997, to being one of the faces of the London Olympics in 2012, has been an ever-present at most major sporting events for the BBC. After years in print media and local radio, John first appeared on national radio in the mid 80s, working for all the major networks – from Newsbeat on Radio 1 to the Today programme on radio 4, where as a news reporter , he covered the Herald of Free Enterprise disaster – the first of many major news stories he has worked on. The Broadcaster of the Year award and the subsequent Radio Personality of the Year title, followed five years presenting a daily a show on Radio 5 Live from its inception in 1994. John has been the face of rugby union on the BBC since presenting Rugby Special in the early 90s, and has covered every Rugby World Cup since 1991. His wide-ranging knowledge of all sport makes him one of the most respected journalistic figures in the industry, being called on regularly to host Charity events, Award ceremonies, high-level national and international conferences on sports development and operation. 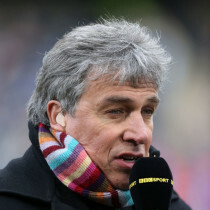 Throughout 2017 and 2018, John Inverdale presented the Rugby 6 Nations for BBC TV and did commentary at Wimbledon for BBC TV, Cheltenham Races, Golf Open, for BBC Radio as well as presenting the French Open for ITV. John Inverdale will present the Autumn Internationals in November 2018 and continue working for BBC TV.